This PDF 1.5 document has been generated by , and has been sent on pdf-archive.com on 24/07/2015 at 02:44, from IP address 93.107.x.x. The current document download page has been viewed 563 times. File size: 603 KB (55 pages). In the case of Telegraaf Media Nederland Landelijke Media B.V.
Editors-in-Chief), on 29 September 2006.
the Ministry for Foreign Affairs. Strasbourg, on 19 June 2012 (Rule 59 § 3). Poole, and also their answers to its questions. Landelijke Media B.V. on 5 January 2011.
born in 1967 and resident in Bovenkarspel. He is a journalist. 1963 and resident in Ridderkerk. He too is a journalist. which this newspaper has been acquainted. actually carried out using weapons seized by the police. second informant operating in the periphery of the criminal organisation. investigations had been made available to criminals including Mink K.
Justice (Minister van Justitie), Mr J.P.H. Donner, on the eight o’clock news. it is afterwards to be deplored that State secrets find their way into the newspapers. ministers (as well as the latter’s denials). 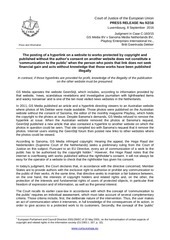 investigation instituted by the AIVD. suspected former staff member have been brought to a close. updated security plan and internal communication on that subject will so ensure. signals which might indicate security risks and better (social) control of non-securityconscious behaviour are indispensible in this connection. pending the outcome of objection proceedings intended to be brought. specific modus operandi or the current state of its information. 22. A hearing in chambers (raadkamer) took place on 17 March 2006.
opportunity arises it will certainly be used. which the applicant may have had in its possession. - [The first applicant] has never had an interest in the content of these documents. period, and the present documents could play a role in this investigation. content of the documents concerned. documents, as proposed by the applicant, should not be considered. 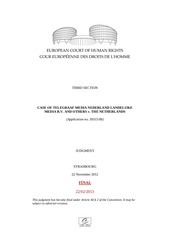 order to safeguard the right freely to gather news (recht van vrije nieuwsgaring). This file has been shared by a user of PDF Archive. Document ID: 00291429.